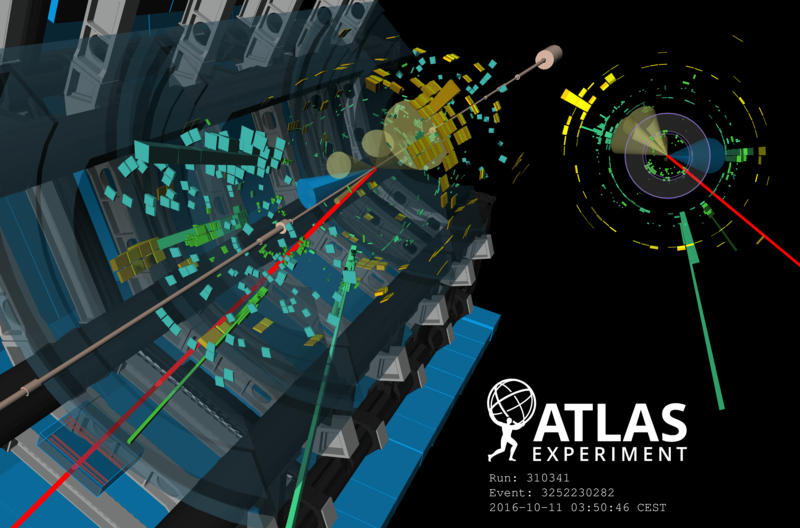 New results from the ATLAS and CMS experiments at the LHC reveal how strongly the Higgs boson interacts with the heaviest known elementary particle, the top quark, corroborating our understanding of the Higgs and setting constraints on new physics. The Higgs boson interacts only with massive particles, yet it was discovered in its decay to two massless photons. Quantum mechanics allows the Higgs to fluctuate for a very short time into a top quark and a top anti-quark, which promptly annihilate each other into a photon pair. The probability of this process occurring varies with the strength of the interaction (known as coupling) between the Higgs boson and top quarks. Its measurement allows us to indirectly infer the value of the Higgs-top coupling. However, undiscovered heavy new-physics particles could likewise participate in this type of decay and alter the result. This is why the Higgs boson is seen as a portal to new physics. A more direct manifestation of the Higgs-top coupling is the emission of a Higgs boson by a top-antitop quark pair. Results presented today, at the LHCP conference in Bologna, describe the observation of this so-called "ttH production" process. 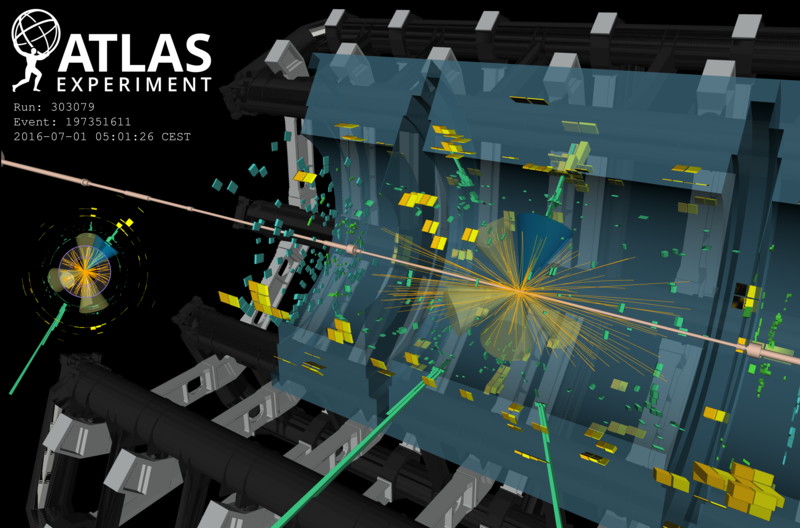 Results from the CMS collaboration, with a significance exceeding five standard deviations (considered the gold standard) for the first time, have just been published in the journal Physical Review Letters; including more data from the ongoing LHC-run, the ATLAS collaboration just submitted new results for publication, with a larger significance. Together, these results are a great step forward in our knowledge of the properties of the Higgs boson. The findings of the two experiments are consistent with one another and with the Standard Model, and give us new clues for where to look for new physics. “These measurements by the CMS and ATLAS Collaborations give a strong indication that the Higgs boson has a key role in the large value of the top quark mass. While this is certainly a key feature of the Standard Model, this is the first time it has been verified experimentally with overwhelming significance,” said Karl Jakobs, Spokesperson of the ATLAS collaboration. Several members of ATLAS Canada, the consortium of Canadian contributors to the experiment, made key contributions to this discovery. Specifically, SFU and TRIUMF/UBC have focused on the ttH production channel where the Higgs boson decays to 2 b-quarks. Contributors from the TRIUMF community include: PhD student Alexander Held (TRIUMF/UBC), PhD student Dan Mori (SFU), postdoctoral fellow Jelena Jovicevic (TRIUMF), scientist Oliver Stelzer-Chilton (TRIUMF/UBC) and SFU faculty Bernd Stelzer. The team developed advanced analysis techniques to help to tease out the tiny ttH signal from the vast amounts of background. Jelena Jovicevic is one of the analysis coordinators for this measurement and will be presenting this exciting new discovery on behalf of the ATLAS collaboration at the LHCP conference in Bologna. Measuring this process is challenging, as it is rare: only 1% of Higgs bosons are produced in association with two top quarks and, in addition, the Higgs and the top quarks decay into other particles in many complex ways, or modes. Using data from proton–proton collisions collected at energies of 7, 8, and 13 TeV, the ATLAS and CMS teams performed several independent searches for ttH production, each targeting different Higgs-decay modes (to W bosons, Z bosons, photons, τ leptons, and bottom-quark jets). To maximize the sensitivity to the experimentally challenging ttH signal, each experiment then combined the results from all of its searches. Significant components of the ATLAS Hadronic Endcap Calorimeters and LHC accelerator complex were built at TRIUMF. The lab’s current upgrade activities are aimed at replacing the first station of the ATLAS muon system, the New Small Wheels (NSWs), and components of the Liquid Argon Calorimetry (LAr). For the High Luminosity LHC, a new all-silicon inner tracker (ITK) is being constructed in addition to replacing the LAr front-end electronics. These upgrades to ATLAS will allow us to continue to explore the nature of the Higgs boson in more detail and search for phenomena beyond the Standard Model. TRIUMF also hosts one of the ten Tier-1 Computing Centres around the world, which process the petabytes of data taken every year by the ATLAS detector and store and distribute them for analysis.